The Texas horse racing industry lost one of its greatest allies and champions when Texas Horse Racing Hall of Fame Executive Director Jo Ann Weber lost her valiant battle with cancer around 5:45 p.m. on Monday, November 22, 2004. Jo Ann was an energetic 70 years young. Weber was widely known and loved for her tireless work on behalf of the Texas horse racing industry over the last several decades, and her formidable fundraising and event planning skills will be missed almost as much as she will be by the many people whose lives she touched. 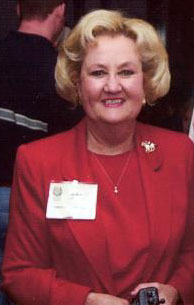 Jo Ann was the perfect executive director for the Texas Horse Racing Hall of Fame. She felt very passionate about preserving the legacy of the Texas horse racing industry and its participants. She was actively involved in the induction process, as well as the planning of the permanent museum and the annual gala. Prior to becoming executive director of the Texas Horse Racing Hall of Fame and Museum, Jo Ann was the manager of the Turf and Field Club at Retama Park in Selma. She had an incredible talent for meeting and greeting people and then turning them into life-long friends. Before her work at Retama Park, Jo Ann worked for the Texas Thoroughbred Association and was highly successful at recruiting new members and organizing events for the association. Jo Ann’s vibrant spirit was an inspiration to those who worked with her. Jo Ann was preceded in death by her husband, Buddy Weber. She is survived by her son, Fred Weber of Lockhart, his wife Shelly, and their daughter. In typical Jo Ann fashion, she planned many of her final arrangements before she passed away. According to her wishes, she will be cremated and there will be memorial service at 2:00 p.m. on Tuesday, November 30 at the First United Methodist Church, 313 West San Antonio Street, Lockhart, Texas 78644, (512) 398-3232. The family has requested charitable contributions in lieu of flowers. JoAnn’s preferred charities include the Susan G. Komen Breast Cancer Foundation and the First United Methodist Church in Luling, Texas.